Mankind has long dreamed of what might be out amongst the stars. We’ve written and produced volumes of material on it. Obsessed over it. Lusted after it. Yet until 2008, there wasn’t even conclusive evidence that other stars aside from our own had planets. And until today, we’d never actually seen on. The photo below is the first ever of an alien planet. No it’s not the bright thing in the center, it’s the little dot in on the top left, orbiting it. 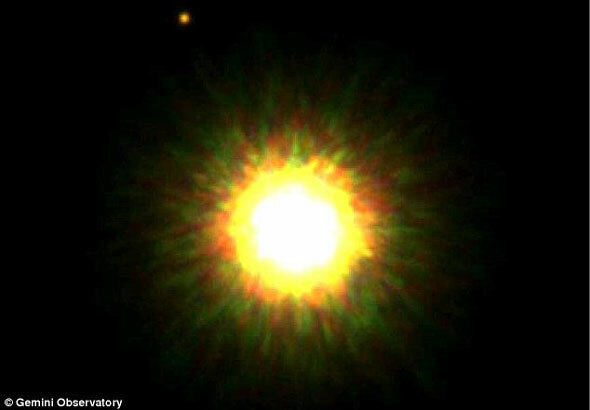 The planet is more than 500 light-years away, in orbit in a solar system known as IRXS 1609, part of a group of stars called the Upper Scorpius Association. Why is this the first planet we’ve ever seen? Because this one is eight times the mass of Jupiter, the biggest planet in our solar system. It’s believed that other stars contain numerous planets in orbit around them, in the same way our sun does, but they’re simply not big enough to see. But this one is massive. So what about alien life? It seems unlikely. The planet has an estimated temperature of 1,500 degrees Celsius, in large part because the star it’s in orbit around is so young, and thus hot. The planet’s solar system is only about 5 million years old. By comparison our solar system, which is also relatively young by galactic standards, is estimated to be around 5 billion years old.